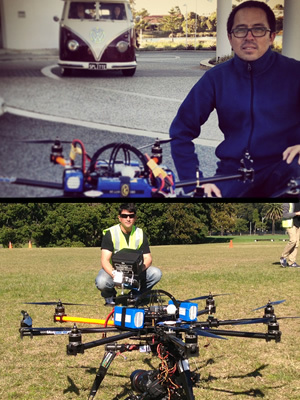 Matthew Chang is a Chief UAV Controller with +35 years of experience constructing and flying model aircraft he has the ability to position drones wherever you desire to achieve angles and camera moves you never thought possible. Operating between zero and 400 feet and up to 60km/h, Matt’s drones are custom designed & developed in-house to carry professional cinema cameras including the Red Epic, Sony FS700, Canon C100-500 & 5D and the Black Magic. State of the art camera stabilization systems and remote control recording, zoom and follow focus can be utilized if required with HD vision sent to multiple remote monitors on the ground. Matt attained his Commercial Pilot’s License in 1989 and has a degree in industrial design from UTS. 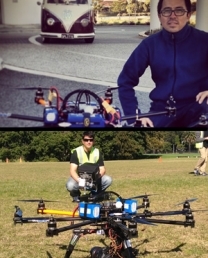 By combining his skill in these areas Matt has successfully developed and innovated Octocopter Drones and Gimbal systems. With a design focus on safety, reliability and high tech control, the result is the design of an industry best UAV built to obtain super smooth, high quality digital footage in most weather conditions. Matt has over 2000 flights under his belt and holds a CASA Operators Certificate and Chief UAV Controller Certificate.